This pattern is written for the beginner knitter who is not ready yet to knit in the round. The mitt is worked flat and then seamed together. 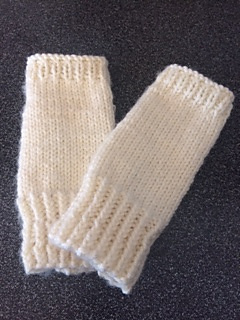 The pattern is written for a small adult size hand, but instructions are included to change the size to fit the measurements for a child or larger adult. I added a second version to this pattern with those in mind who never knitted before. I have used the pattern many times to teach how to knit. The basic stitches are explained in the pattern, too.